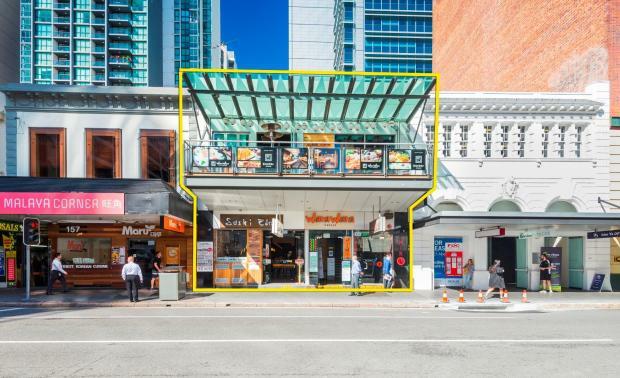 A fully leased freehold investment opposite the Wintergarden Centre in the heart of the Brisbane CBD has been sold at auction for $9.3 million. The retail building at 153 Elizabeth Street, Brisbane, was sold under the hammer to a private investor at the Ray White Commercial Investment auction in Brisbane by Ray White Commercial Queensland Director of Sales, John Dwyer, on behalf of Brisbane development company DeMartini Fletcher for a yield of 4.95 per cent. Mr Dwyer said there were six registered bidders at the Ray White Corporate auction rooms at 111 Eagle Street, Brisbane, and a highly competitive bidding environment for the property, which generates net rental income of approximately $460,525 per annum. “We had a tremendous response to our formal marketing with almost 100 inquiries for this property,” Mr Dwyer said. “What was most noteworthy was the depth and geographical spread of that inquiry with strong interest from Asian buyers as well as Sydney-based investors now looking to Brisbane as their local market is so hot. “Bidding at what was an exciting auction conducted by Ray White Queensland’s Chief Auctioneer Philip Parker started at $5 million and there were more than 30 bids before the property was sold under the hammer to a local investor for $9.3 million. Mr Dwyer said he had been involved in the sale of three CBD retail buildings in the Brisbane CBD this year and there was strong demand for tenanted property in the city centre. “In recent months we have sold 105 Albert St for $4.825 million and 201 Elizabeth St for $5.65 million, which were well located freehold investments,” he said. The building at 153 Elizabeth St has a net lettable area of 976 sqm and the site, which offers vehicular access via Charlotte St, is approximately 463 sqm with potential for amalgamation. “The property has three tenancies all with an excellent lease expiry profile,” Mr Dwyer said.